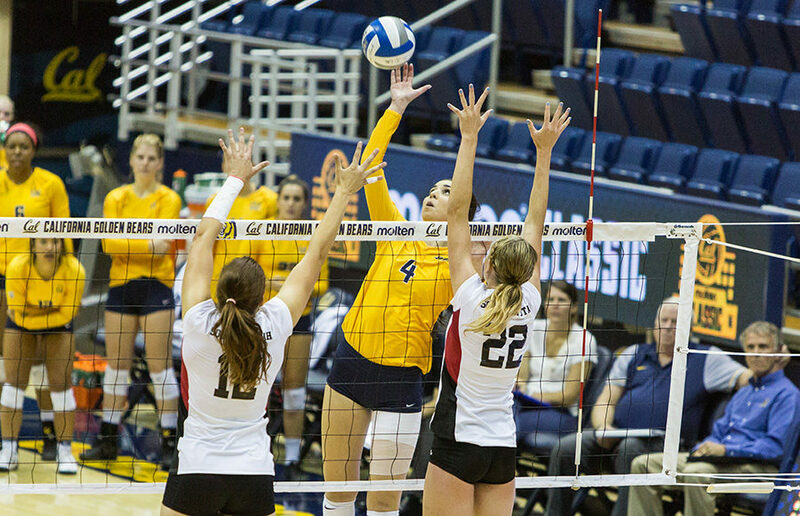 It was a tale of two teams this weekend, as the Cal volleyball team showed the best and worst versions of itself in its final nonconference matches of the season. In a year marred by inconsistency thus far, this weekend’s games were prime examples of the talent present on the Bears’ roster as well as the immense room for growth that the team has. Cal underperformed significantly against the University of Pacific on Friday, losing in straight sets to the Tigers. But, the Bears responded Saturday with a victory against Saint Mary’s, closing out the nonconference portion of their schedule with a 6-4 record — a very marginal improvement from the 6-5 mark they held entering Pac-12 play last year. In Stockton, Cal struggled against the Tigers’ serve and was unable to establish its offensive flow. The Bears’ passing was uncharacteristically poor as a result of their inability to return serves effectively, which caused the team to suffer in other areas. While Pacific recorded six aces, a significant number though not extraordinarily high, it also had a number of serves that forced Cal to abandon its offensive game plan and led to easy points. The Bears lost the first and third sets handily, 25-15 and 25-14, respectively. Their only glimmer of hope against the Tigers came in the second set, with the score tied at 11. Cal, however, fell apart in the latter half of the set, conceding it 25-17. After an underwhelming performance Friday, the Bears headed to Moraga to compete against Saint Mary’s. Cal started strong, winning the first set 25-21, before dropping the second set, 25-20, to the Gaels. The Bears played better as the match progressed and captured the final two sets in tightly contested fashion, 25-22 and 25-23. From the numbers, Cal’s defense seemed to make the difference, edging out Saint Mary’s in blocks (11-6) and digs (75-67). Maddie Haynes dominated Saturday, recording a career-high 18 kills that included the final four kills of the game. Feller’s decision to play Haynes in all four sets paid massive dividends. The most notable part of Haynes’ performance was her ability to record timely hits, especially her back-to-back kills that pushed the score to 24-22 in the final set of the match. Junior Christine Alftin and freshman Bailee Huizenga also contributed significantly to Saturday’s win, chipping in 13 and 12 kills, respectively. Saturday’s win was convincing enough that the coaching staff could now be inclined to use the same lineup in upcoming matches against Pac-12 teams. Throughout the past few weeks, Feller and his staff have been making minor tweaks to the team’s rotation with the hopes of discovering the most effective combinations. The Bears’ offense and defense seemed to click Saturday and they showed resilience in winning two closely fought sets. Now, they’ll need to carry those habits into their matchups against opponents in the Pac-12 — a conference in which half of the teams are currently ranked in the top 25.